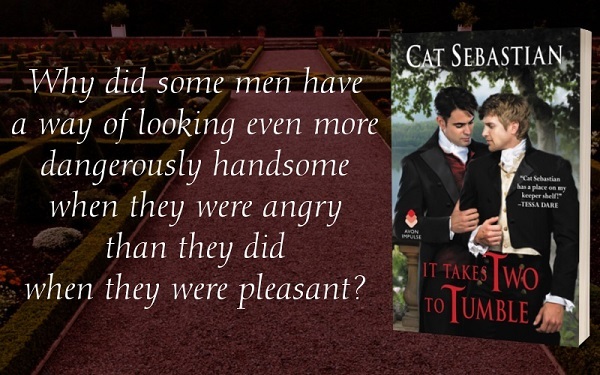 It Takes Two to Tumble is the first installment in the Seducing the Sedgwicks series. The novel was a wonderfully paced, forbidden, historical romance on several levels, between a ship captain and a vicar. Ben Sedgwick has the perfect personality to be a vicar. Calm. Compassionate. Charitable. The only issue is that his sexual nature is not only a crime, but also against church doctrine. 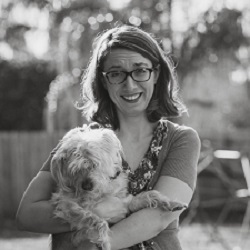 What was refreshing about Ben was how he didn't bleed guilt or shame – he understood himself, and didn't hesitate to reach out and take what he wanted. Ben had surprising strength and authority for a man with a server soul. Captain Phillip Dacre's ship has come in... sending the grieving man back to the land he knows so well, but it's filled with strangers. The widower doesn't know his children, only coming home every few years for a month or two, before returning back to sea. Phillip's people, and those surrounding the area, don't welcome him home with much fanfare. Dacre's three children run wild without anyone rearing them – just in time for their father to come home, Ben is called to stop the mischievous children's scourge across the countryside. Ben moves into Dacre's home, and the kids take to his style of child-minding. Ben and Phillip have a physical connection at-first-sight, but it's mixed with the tension of the era and their circumstance. Ben is slightly afraid of Dacre, his reputation preceding him. Dacre sees Ben as an interloper, interfering with his children, making so they don't bond with him. After head butting, which lends a love-hate vibe to the novel, they come to an understanding. 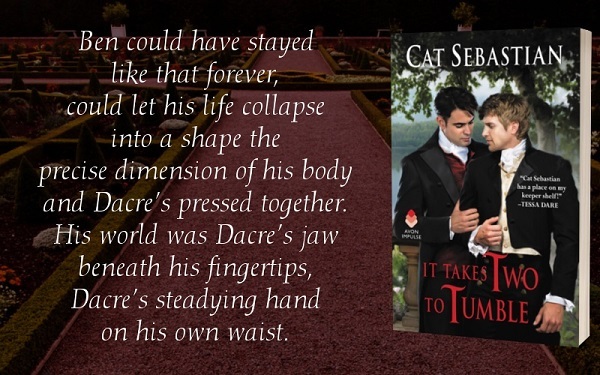 It Take two to Tumble was paced to always keep my interests, from page one to the end. The interactions and exchanges between the two heroes of the tale were entertaining. The forbidden romance was angsty due to their circumstance, but refreshingly no-holds-barred by the men. The between-the-sheets action was smoldering yet intimate. There are a few other side romances happening beneath the surface, by side characters who will never get their own novels, as well as seeding the series for future installments. The side characters were entertaining, humorous and understanding, or intriguing. Ben's father in particular was a kooky man (as narrated by Ben), but he was a favorite of mine. I was pleased to see the struggle of dyslexia, and how Ben found inventive ways to teach Jamie, and how this helped Phillip in turn. The happily ever after not only resolved their issues, it also fit their personalities perfectly. I highly recommend to fans of MM romance, and look forward to the next in the series. 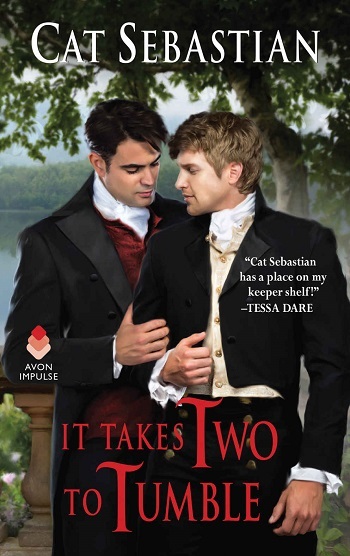 To celebrate the release of It Takes Two to Tumble, we're giving away one paperback copy of The Ruin of a Rake by Cat Sebastian. 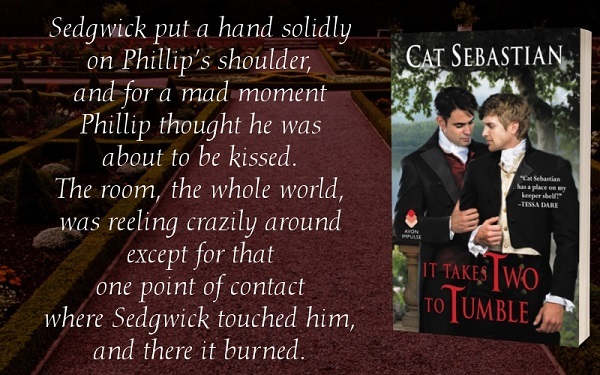 Reviewers on the Wicked Reads Review Team were provided a free copy of It Takes Two to Tumble (Seducing the Sedgwicks #1) by Cat Sebastian to read and review for this tour.